The Maingear Drift is a gorgeously customizable desktop for gamers high on cash and low on desk space. Every few months, Maingear likes to pop in our office like a high-tech Santa Claus and drop off a tricked-out custom gaming PC that none of us could ever reasonably afford. The latest such behemoth is the new Maingear Drift: a sleek, sporty powerhouse that’s quite small for a tower and just slim enough to fit into larger entertainment centers. The Drift’s blazing performance and plethora of premium customization options make it fantastic for gamers high on cash and low on desk space, though budget shoppers should look elsewhere. Without looking at any logos or packaging, I knew the Drift was a Maingear PC the second I laid eyes on it. The company just has a knack for making desktops that are droolworthy tech showpieces, as made evident by the Drift’s transparent glass side panel that reveals the mesmerizing maze of colored cooling tubes inside. I’m an especially big fan of our Drift’s white-and-teal color scheme, which looks like it was custom-built for one of my favorite Overwatch characters: the bubbly, ice-slinging Mei. As with any Maingear PC, you can have the Drift painted in whichever crazy color combination you like — including some extra-luxurious automotive paint options. While the Drift looks stunning standing up, you can screw off its vertical base if you want to lay it flat under your TV. At 18.3 X 15.11 x 5.8 inches and a hefty 35 pounds, the Drift won’t blend into your entertainment center as neatly as a PS4 or an Xbox One would, and it’s not nearly as small as other living-room-minded PCs such as theMSI Trident and the Origin Chronos. Still, the Drift is about 20 percent smaller than Maingear’s F131 and looks tiny next to a high-end competitor such as the Origin Millennium, making it a good middle ground for those with a decent amount of desk or shelf space. The Drift’s front-facing port layout packs all of your essentials: two USB 3.0 ports, headphone and mic jacks and a Blu-ray disc drive. In the back, you’ll find four USB 3.0 ports, two USB 3.1 ports, two USB 2.0 ports, a PS/2 port for older accessories and a standard smattering of audio jacks. You’ll also find two Gigabit Ethernet jacks for maximum speeds, as well as an eSATA port for external storage. Removing the Drift’s glass side panel is as easy as removing some hand screws, though you’ll probably be doing more basic maintenance than full-on upgrading due to the complex layout of tubes and wires beneath. Fortunately, the system comes with a one-year warranty in addition to lifetime labor support, so Maingear should be able to handle any major part replacement issues for you. Offering the latest 10-series Nvidia Titan X graphics card, our Drift churned out some of the best gaming performance you can get from a single GPU. The machine made quick work of the action-platforming of Rise of the Tomb Raider, rendering the game’s gorgeous environments and detailed hair physics at 91 frames per second with graphics cranked all the way up at 1080p. The Drift faltered a bit under the same settings at 4K resolution, turning in a just-playable 29.5 fps. That’s comparable to the frame rates we typically get from even the highest-end systems, the game at the highest possible settings at 4K. This rig is more than ready for high-end virtual reality, scoring a strong 11 points on Valve’s SteamVR performance test. Maingear’s PC had a much easier time with the slick stealth action of Hitman, running our benchmark (1080p at max settings) at a swift 140.9 fps, crushing our 83 fps gaming desktop average. The chaotic open-world action of Grand Theft Auto V was also no match for the Drift, running at a breezy 114.2 fps at 1080p with graphics maxed out. That smokes our 63 fps average. The Drift is more than ready for high-end virtual reality, scoring a strong 11 points on Valve’s SteamVR performance test. That’s the highest score we’ve seen yet, and is on a par with GTX 1080-powered machines, such as the Alienware Aurora and the Lenovo IdeaCentre Y900. Older machines with GTX 970 graphics cards tend to score closer to six. The Drift scored a 6,987 on the Fire Strike Ultra test (which measures 4K performance), trailing the Millennium (13,750) and our three-GPU Area 51 (7,531), while crushing our 3,451 gaming desktop average. Armed with an Intel Core i7-6950X processor, 16GB of RAM and Maingear’s Redline overclocking technology, our Drift offered blazing performance across the board. Maingear’s PC remained speedy no matter which combination of tasks I threw at it, even as I bounced between four Twitch streams, downloaded a game and ran a full system scan all at once. The Drift scored a 25,777 on the Geekbench 4 general performance test, trailing our Origin Millennium (Core i7-6950X, 32,035) while topping our Core i7 5820K-powered Alienware Area 51 (21,060) and our 13,346 desktop average. On our spreadsheet test, Maingear’s PC copied 20,000 names to addresses in 3 minutes and 15 seconds. That’s quicker than the Millenium (3:01) and the Area 51 (3:50) as well as our 3:29 average. Our Drift’s 512GB SSD copied about 5GB of files in a whopping 10 seconds, for an ultrafast transfer rate of 508.92 MBps. Our Origin Millennium’s 512GB SSD was just a smidge faster at 565.47 MBps, while our Area 51’s 256GB SSD turned in a slower 221 MBps. The Maingear Drift is a made-to-order system, meaning it’s only as expensive and over-the-top as you want it to be. Basic models start at $1,299 for an Intel Z270-based system, which features an Intel Core i5-7500 processor, 8GB of RAM, an AMD Radeon RX 460 graphics card and 1TB of storage. High-end Superstock models (which feature hand-crafted liquid cooling tubes) start at $4,099 with a Core i5-7500 CPU, 8GB RAM, a Radeon RX 480 GPU and a 1TB hard drive. From there, you’re free to upgrade to whichever high-end components you like, including Nvidia’s GTX 1080 graphics card ($565 extra), the latest Intel Core i7 processors (add $145) and any combination of high-speed storage drives. Slapping on a coat of fancy automotive paint will run you at least another $499, but there are plenty of stylish color options (including Alpine White, Sapphire Blue, and Copper Orange) for those who prefer to splurge. 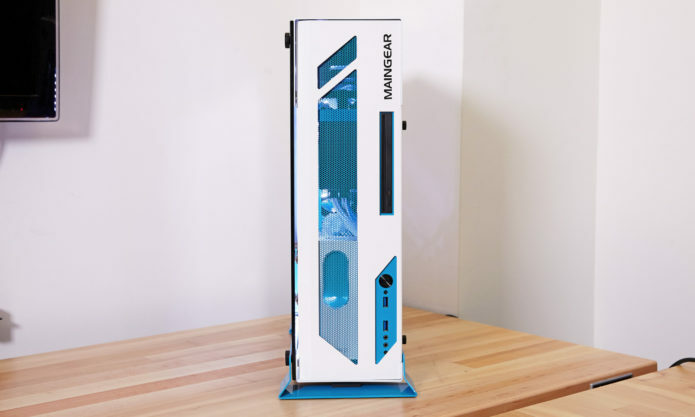 Maingear sent us a tricked-out $7,550 version of the Drift, which has a natural white finish on the outside with baby blue paint and white LED lights on the inside. The system is powered by an Intel Core i7 6950X processor, 16GB of RAM, a 2TB hard drive with a 512GB SSD and Nvidia’s high-end Titan X graphics card. Other goodies on our luxury model include a 6X Blu-Ray drive, dual Ethernet ports and Maingear’s Redline overclocking tech, which allows you to safely push the performance of the machine. As with all Maingear PCs, the Drift is a stunning gaming desktop aimed at those willing to pay for top performance and an exquisite custom design. It’s not exactly console-size, but it won’t devour too much of your desk space, and will look great in your entertainment center, provided you have the room for it. And with support for extremely fast Intel Core i7 processors, the highest-end GPUs and plenty of custom cooling options, the Drift delivers when it comes to pure horsepower. One of the Drift’s only notable cons is its lack of multi-GPU support, which is fairly common on higher-end systems such as the Origin Millennium and Maingear’s own F131. Still, the Drift’s single graphics card slot keeps it smaller than both of those desktops, and you’ll probably be fine with a single GPU as long as you’re not powering a plethora of 4K monitors. Overall, if your budget is high and your shelf space is low, the Maingear Drift is one of the most gorgeous and customizable premium gaming PCs out there.